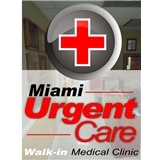 Family Practice and Miami Urgent Care (Coral Gables) - Book Appointment Online! Family Practice combined with Urgent Care. Best of both worlds. All your medical care in one location. Convenient morning, evening and weekend appointments available for routine care. Walk ins accepted 7 days a week as well when you are ill. I liked Dr Mones' treatment. He wasn't rushing and was very personable to me.